There’s an interesting piece of history hiding in the outer reaches of the GDA (Greater Dodgeville Area, loosely defined as any place I can reach by bike) just north of Newmarket: the scattered remnants of the Newmarket Canal. This never-finished canal was to be a southerly branch of the Trent-Severn canal from Lake Simcoe to Aurora via the Holland River. This was not a trivial undertaking for many reasons, not the least of which was that there just wasn’t enough water in the river to operate a canal. The initial plan for the canal called for reservoirs to be fed by water diverted from Lake Wilcox, the source of the Humber River. 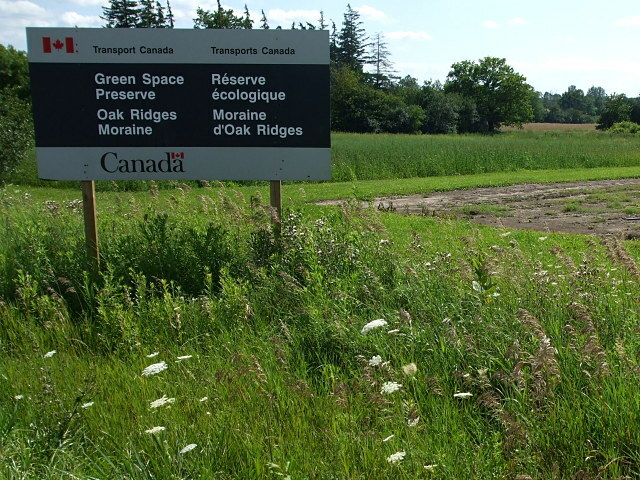 That plan was later shelved as being too expensive and politically unpopular, and was replaced by a scheme to pump the necessary water uphill from Lake Simcoe to the top of the Oak Ridges Moraine at Aurora. Work on the canal was to be done in three stages: the first required that the river be dredged from Lake Simcoe to Holland Landing. The second required three locks to be built between Holland Landing and Newmarket (the second of those locks is pictured above). The final phase, from Newmarket to Aurora, would require an additional five or six locks depending on the final route, which still hadn’t been finalized when construction began. Even as the work on the canal began in 1906 and continued for five years, there was still no clear plan for keeping enough water in the canal to keep it navigable during any period of the year outside the spring thaw. Increasing public opposition, escalating costs, and a change in government ultimately doomed the project in 1912 after years of political shenanigans, interference, and scandals that would make most modern politicians blanche. At that point, most of the work on the canal through Holland Landing and up to Newmarket had been completed. The three lock structures and the base of one swing bridge that had been built before the project was called off still stand along the east branch of the Holland River north of Newmarket. James T. Angus’s comprehensive book, A Respectable Ditch: A History of the Trent-Severn Waterway 1833–1920, details the tortuous political and physical paths of the entire project’s 90 years of debate, design, and construction. It devotes a chapter to the Newmarket Canal debacle and is well worth reading. This was at least the second planned canal along this route. The other would have gone straight through the Oak Ridges Moraine and connected to Lake Ontario via the Humber River. 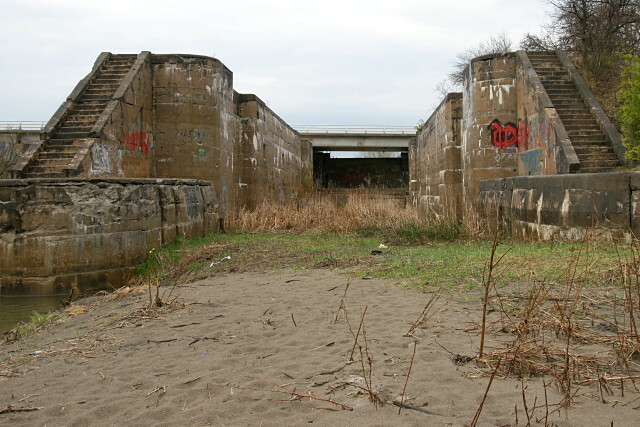 I first visited two of the abandoned lock structures almost 20 years ago, shortly after learning about the Newmarket Canal in Ron Brown‘s excellent guidebook, 50 Unusual Things to See in Ontario. I finally visited the third lock and the swing bridge just this past September. Looking back now, 50 Unusual Things was probably what set me off on my habit of exploring the GDA and finding unusual sights and abandoned bits of the city. Damn you, Ron Brown! My most recent cycling visit to the canal was on Saturday, during which I was trapped under a sheltering bridge for an hour and a half by that big storm that whipped across southern Ontario. I eventually called Risa to rescue me with the car after giving up hope that the lightning, rain, and wind would let up in time for me to get back home at a reasonable hour. The irony here is that I was stuck within spitting distance of the East Gwillimbury GO station. I could easily have gone home by train, but the next one was 36 hours away on Monday morning and I wouldn’t have been able to take my bike on it. Hello GO? Weekend service, please. More pictures below the fold. 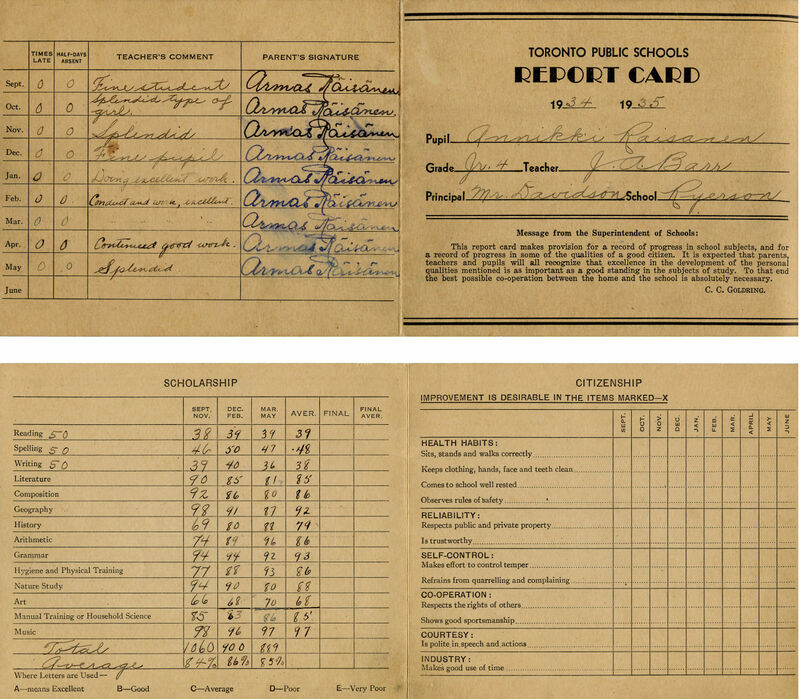 I can tell you one thing for sure: if I’d gone to Ryerson Public School in the 1930s, I would definitely have failed sitting, standing, and walking correctly and coming to school well rested. But I would have aced making an effort to control my temper. All of the other qualities of a good citizen could have gone either way. Check out the full-sized scan to see all of the things they don’t teach in school any more. Passmore Avenue looking west from west of Beare Road. If you’re familiar with Passmore Avenue in Scarborough at all, it’s probably as an unremarkable industrial street that runs in two discontinuous sections between Kennedy Road and Markham Road. But along with the rest of the concession roads in Scarborough, it long predates suburbia: it was laid out and cleared in the 1800s. On an 1878 map, Passmore (then known only as Concession Road 5) stretched 14 km clear across the township of Scarborough with only three short sections missing where the road would have crossed the Rouge River. More modern maps and aerial photos show that Passmore remained a country road crossing Scarborough well into the 1960s, when portions of it started falling to suburban development or neglect. Although the Passmore name has virtually disappeared over the last 50 years as Scarborough grew from farming township into a suburb, most of the original route still carves its way through the former borough. West of Markham Road, the original road allowance is given over to portions of more than a dozen different suburban roads and park pathways that trace the old road, starting with Gordon Baker Road in the west and continuing to Ketchum Place near Middlefield Road. Drivers can’t follow the entire road thanks to all of the twisty-weavy suburban streets, but multi-use paths directly connect the whole route (except for one block) to allow a continuous 8 km long suburban walking or cycling tour along the old right of way from Victoria Park Avenue to beyond Markham Road. There’s no physical evidence of the original road here other than the straight route through the heart of suburbia. East of Markham Road, Passmore was never much more than a dirt road through the countryside. Except for three very short half-blocks that still exist, most of it no longer appears on maps and has dropped off the municipal street grid. Yet the old road allowance remains largely open to intrepid hikers in this rural corner of the city. 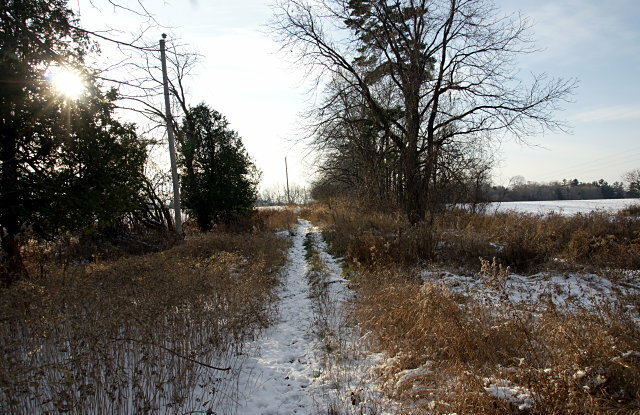 The most accessible portion of Passmore Avenue runs between Gordon Murison Lane and Beare Road, where a line of utility poles stands guard over the old dirt road as it dips into a small valley, passes farm fields on either side, and crosses a small tributary of the Rouge River before climbing back up a low hill at the other end. A partial tour of the eastern half of Passmore and more photos are below the fold. …expropriate your farm, board up your house, and let much of your land lie fallow while we spend 40 years trying to justify building a huge and unnecessary airport on prime agricultural and ecologically sensitive land. Um, I mean, I’m from the government and I’m here to preserve your green space. 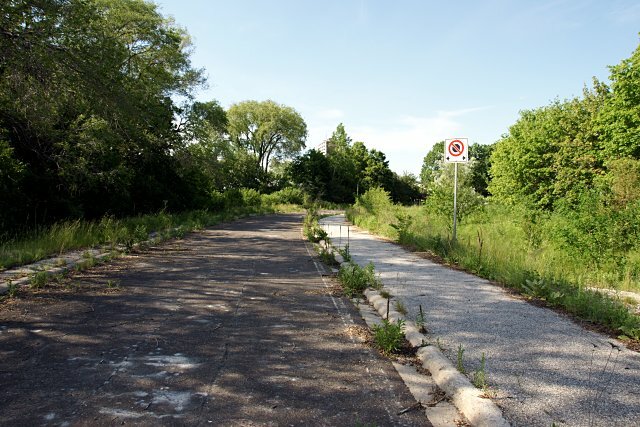 Driving down the DVP a couple of weeks ago, I noticed an old roadway cutting through the brush just north of York Mills Road. I had a pretty good idea of what it was, but a quick look at Google Maps confirmed my suspicion: it was an abandoned on-ramp to the southbound Don Valley Parkway from westbound York Mills Road. The current DVP ramps at York Mills were reconfigured during construction to the overpass beginning in 2005. The northwestern loop of the cloverleaf was removed entirely. Or was it? I went back by bike last weekend (the same ride where I blew out a tire) to investigate and was quite surprised by what I found. Not only was virtually the entire ramp still intact, but there had been no attempt to restrict access to it. I was expecting to see the traditional Toronto chain-link fence surrounding the road, but all I had to do was ride up a little hill before I was greeted by the remnants of the ramp in all its glory. I’m not saying that there should be a fence, just that I was expecting one. Toronto officialdom is so paranoid about putting fences and warning signs around everything more challenging than a sidewalk that I never imagined for a second that it wouldn’t be all locked up. 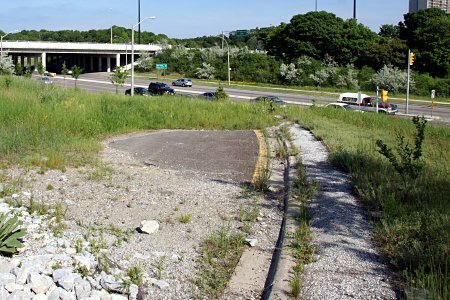 Although the subsequent landscaping at York Mills Road put the ramp’s remnants out of sight, the bulk of the road still sits behind the embankment, where it’s being slowly consumed by encroaching weeds. The posts that held up corrugated beam safety barriers around the perimeter of the ramp were cut down to the ground and a stone-lined drainage ditch has been dug across the roadway, but the ramp is otherwise intact to within a few metres of the highway. Although you’re never farther than 100 metres from either York Mills or the DVP, the curving tree-lined ramp quickly isolates you from both. Even with the sound of traffic in the background, it’s surprisingly relaxing. The current Google Maps image of the area, probably taken in 2005 or 2006, clearly shows an excavator perched at the very bottom of the ramp, presumably preparing to rip up the 50 metres or so of the roadway that was removed. At some point, the now-unused land here will probably be sold off for—what else?—condos, and another little piece of Toronto infrastructure will disappear completely. In the meantime, this hidden corner of the city is being rezoned by the local flora. A version of this post originally appeared on Torontoist. 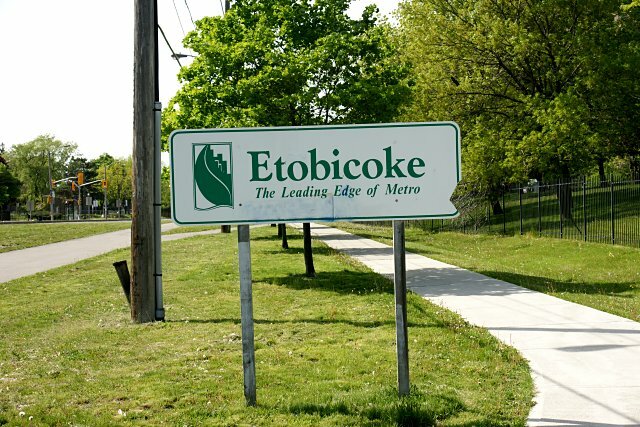 For some reason, this sign still stands along the bike path near Albion Road, ten years after Etobicoke was folded into the Megacity. I recently saw a picture of this same sign (about halfway down this page) taken last year. A fairly fresh tag shown on last year’s picture is a mostly-erased blue smudge on this year’s. Not only does this sign yet exist, but someone seems to be maintaining it. How efficient. Way up in the very northwestern corner of the city, the old Indian Line used to mark the boundary between Etobicoke and Peel Region (Mississauga and Brampton). The road carved its way through farm fields and across a bridge over the Humber River before continuing north past Steeles Avenue. 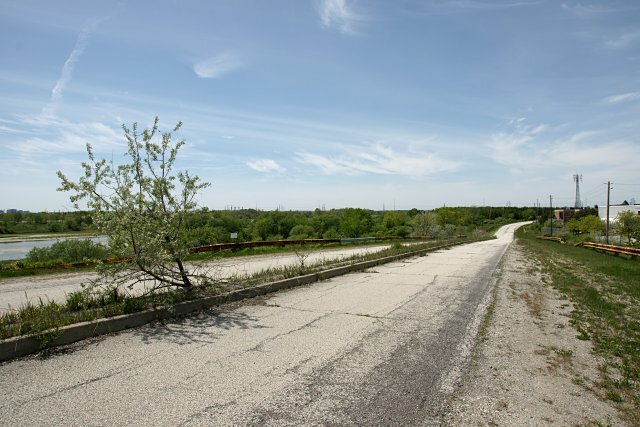 Most of the old road was effectively wiped out by the initial construction and subsequent widening and extending of Highway 427 starting in the late 1960s and continuing through the early 1990s. Other portions of the road fell victim to realignments of Albion Road, Steeles Avenue, and Regional Road 50 heading north out of the city. 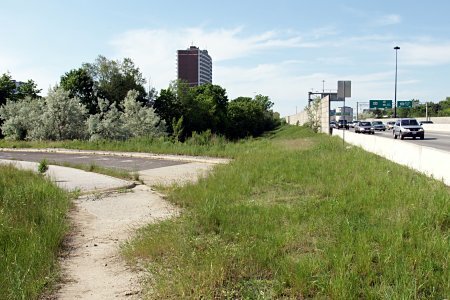 But as with other abandoned roads in the city, a few stretches of the old roadway still exist. A tour and more pictures follow. Above the front door are the faded words “Testing Building.” It once housed the Toronto Port Authority’s gauge for measuring lake levels. It has played a role in films over the years, including Bulletproof Monk and Canadian Bacon. For the 2006 Michael Douglas film, The Sentinel, it was converted into an east coast fishing shanty, complete with lobster traps. 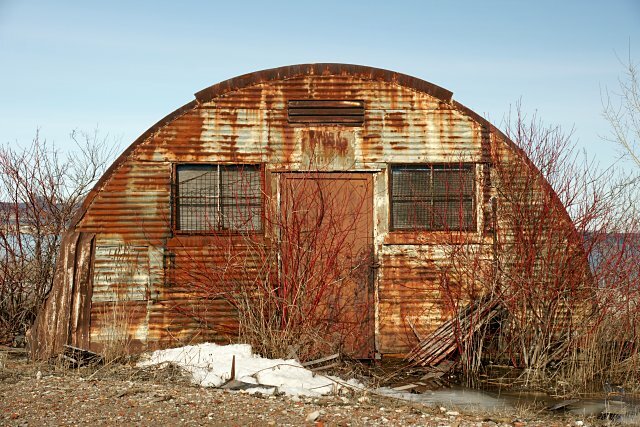 Shawn also reports that the Quonset will be demolished and a proper visitor centre erected in its place. Although the building is obviously past its best-before date, I’ll still miss it when it’s gone. Tomorrow: the final edition of Spring on the Spit. may have been a part of an old Indian trail that crossed the city along what is now Davenport Road and entered the Don Valley through the Rosedale Valley ravine. There are records of the Mississauga Indians having encamped on the Don near Pottery Road as late as 1831. I always find it interesting that so much of our modern infrastructure follows old trails, watercourses, and terrain, even decades or centuries after after the old features have ceased to exist on any meaningful level. Technology may have brought us huge bridges across the valley and personal motorized transportation, yet there’s Pottery Road, tracing an old footpath in the Don and still used by thousands of people a day. Some things never change. 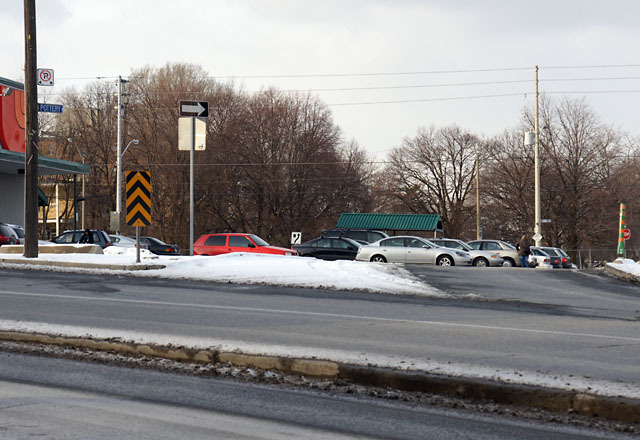 Frequent northbound travellers on the Bayview Extension have probably noticed the “Pottery Road” street sign pointing to a glorified supermarket driveway at the top of the hill, just south of Moore Avenue. Some may even have wondered how it relates to the more familiar street of the same name almost 1.5 kilometers to the south, winding up the valley wall to Broadview Avenue. The answer to this puzzle is that the two Pottery Roads used to be one, connecting Broadview and Moore Avenues, roughly following Cudmore Creek for much of its length. Most of the road was abandoned when the Bayview Extension was constructed in the late 1950s. The section running from Broadview to Bayview was left mostly intact (and the top of it was later realigned to allow an easier climb out of the valley), as was a very short block at the northern end of the road, now flanked by parking lots for a supermarket and a bank. What about the kilometer of the road that used to connect the two remaining sections? 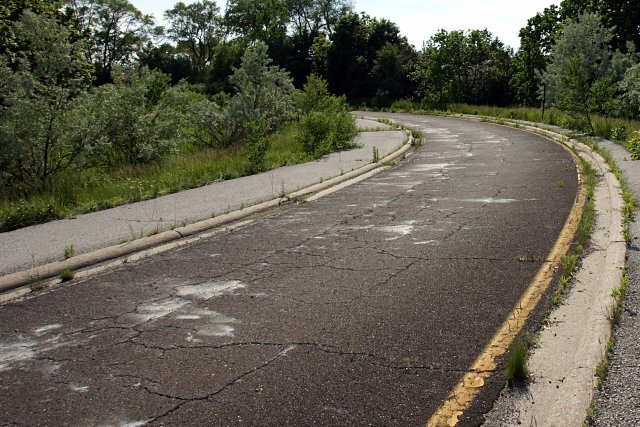 Unlike most abandoned roads that exist only for short stretches of their former selves, old Pottery Road is unique: its entire original route from Broadview to Moore is still open and can be hiked from beginning to end. Read on for the complete walking tour.